jflicks for cord cutters – A whole house DVR for cord cutters. To be honest we haven’t been doing a lot of development of j4cc the last year or so. It’s been kind of just working for us and over-the-air TV has been less of a priority and taking less of our viewing time. Since we have been streaming more through YouTube Red, Netflix, Amazon, iTunes, one gets used to commercial free viewing. Supporting content creators that you like through fees to these services and being AD-free is certainly our preference. We understand not everyone feels this way, however it is nice to have the choice. Having said all that, recently we have been wanting to spend more time with the video we can record and watch for free. For us this time of year, TV is pretty bare boned as we are not interested much in the current live sports. Being basically a football and baseball fan, these few months during the cold of Winter are pretty boring. We realized we had a pretty bad bug in respect to fetching TV artwork from thetvdb.com. That site had made a change that caused the Java code we are using to fail. From our perspective it’s simple code, just one line of code called on a Java system class. The change that thetvdb.com made caused this one line of code to fail. We had to implement a method to use instead of this one line of code to fix the problem. When we were looking for a fix for this we noticed that a project called Comskip had also made a change. Comskip is a terrific program that can detect commercials in a TV recording. In the past it only would compile on Windows. Since j4cc strives to be cross platform it was harder to get it to work on Linux and Mac, but it was possible by using Wine. The real issue was the author of Comskip asked for donations to use Comskip. I had asked the author if I could redistribute Comskip, he said it would be OK but he did not say so very enthusiastically. And since it would still be a bit of a hassle to get it to work on Linux and Mac I opted to not include it in j4cc. I wrote my own commercial detector using ffmpeg to sense the blank and silent frames in the recording. It generally worked pretty poorly but it was something. Lo and behold I saw that Comskip source code was now available on Github and it now compiled on Linux and Mac. The author is now allowing to include Comskip with third party packages like j4cc. The author of Comskip just asks that users are made aware of the donation aspect of Comskip. I highly recommend donating if you can because it is terrific software. The 1.2 version of j4cc now includes Comskip. You will see greatly improved commercial detection. It’s not perfect but it is very good. See the Software page or just do an update using your current version. One bit of news out of the 2016 WWDC might be good for j4cc users, including myself! 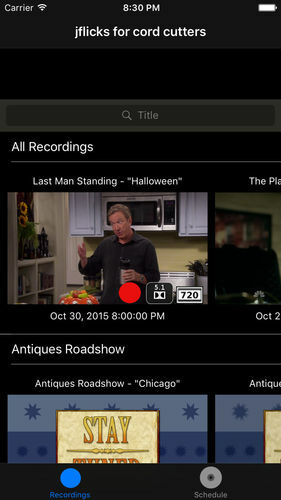 Sling TV has released an app for the Apple TV. The offering from them is known as a “skinny” bundle. A smaller set of channels for a smaller amount of money. In this case about 30 channels for $20. Most people feel they pay too much for 200 channels because they watch only 15 or so. For me it is not that what bothered me. I did not like that some of my hard earned money went to channels I just did not like, I was forced to pay them. I believe that as a citizen I should be able to vote with my wallet. Support commercial enterprises of my choosing for whatever reason I chose. I know that is different than most people, they just look at what they are paying each month. If the system was to pay for individual channels or ala carte, they argue that you would end up paying just as much. Now I have the opportunity to have the best video entertainment system. With jflicks for cord cutters server and app I can record and watch live TV from my antenna. Along with Sling TV and their skinny bundle I can have more live TV without paying an arm and a leg. All using the Apple TV and one remote control. For me it is now the one streaming box to rule them all. Sling TV has had an iOS app but they had disabled AirPlay. Using AirPlay the app only needs to start the video and “send” it to AirPlay device which is usually an Apple TV. Then the iOS device can be turned off saving battery. The reason you can turn off the iOS device is because it is not really sending the video to the Apple TV, it just sent a URL and the Apple TV fetches the video bits. Unfortunately, the only alternative is to use AirPlay “mirroring”. What that is doing is sending the actual screen bits to the Apple TV and requires the iOS device to stay on using battery. Now I had tested the mirroring and was surprised that the quality was not too bad. But just out of the principle of the thing I refused to be a Sling TV customer because they were not supporting me as a user. Knowing how simple it is to code and use AirPlay I know they purposely disabled it. AirPlay support is good, as the jflicks for cord cutters mobile app uses it. However I have to admit that since I have written the jflicks for cord cutters Apple TV 4 app, I much prefer just using the Apple TV remote and the app on screen. A much better experience. In my life as a cord cutter I was missing one thing – Yankee baseball games. I live in market so I cannot watch the Yankee games on MLB because they would be blacked out. It is just so crazy, I would happily pay MLB to watch if they would just let me! So I am limited to about 2 dozen Yankee games this season on TV. They are on local TV which picks up the broadcast from WPIX in New York. Then a few national Fox games on Saturday nights are also on my TV. So the rest of the games I listen on radio. Now that Sling TV has an Apple TV 4 app and includes “your regional sports channel”, the YES network in my case, I can now buy the Yankee games I wanted. I have been testing and watching for a week now and overall I would say it is good. The quality of the video is not that of Netflix, Amazon, YouTube, or iTunes. What I mean by that is the Sling TV buffering, freezes, and pixelation is much worse than the others. I never seem to have those issues on the other systems except perhaps Amazon when a video first starts, it starts pretty crappy looking. Of course because the work I have done on the j4cc apps I understand how HLS (http live streaming) works and know the pixelization is because the video data is just not getting to the player fast enough so the system lowers the resolution to try to keep up. Either the Sling TV servers cannot keep up or my ISP cannot or will not get those bits to me fast enough. I have seen the quality improve over the week so perhaps many new Apple TV users signed up along with me this week and they were unprepared for the load. Overall I am happy to have the choice now. I am certainly keeping Sling TV for the baseball season and may keep it longer if I feel I am getting value out of it! I am happy to announce that the iOS app that can access the services of the jflicks for cord cutters server has been released in the App store. The iOS app allows you to watch and control the j4cc server software running on a server on your local network. And you can watch on your Apple TV (version 3 and prior) using Apple Airplay. 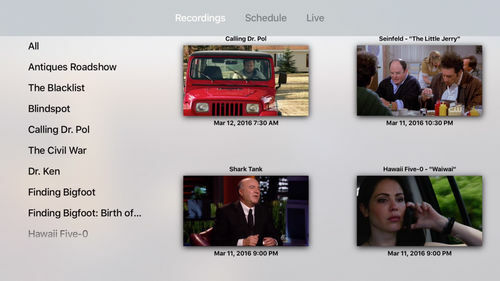 The iOS app supports everything that the tvOS does except for live TV. You still get the same benefits of being a cord cutter where perhaps if you are like me you can save a ton of money over time. I was given the new Apple TV 4 as a developer by Apple late last summer in a “raffle”. The new device was going to be an iOS device and we could use real tools and code to write applications for it. And it was going to be open to all developers. Earlier versions the only way to write an app was to be a partner of Apple and to extend a web template framework to customize it for your data. It is why most apps in that era looked so much alike. And as a developer working on the other platforms is not rewarding at all – the tooling is not very good and in the case of the Roku you only have a scripting engine to work with which is very limiting. Perhaps they have improved it but when I was looking into it and trying to write an app it was very frustrating. Of course that is just my experience and if others are happy then I am happy for you. So to say the least I was very enthused to be able to write an app for tvOS using the the tools and language I had been using and had some experience with. And to get a free Apple TV 4 was icing on the cake. I am happy to announce that the Apple TV 4 app that can access the services of the jflicks for cord cutters server has been released in the Apple app store. My local recordings using the j4cc app. Recorded by my j4cc server on a Linux box accessing HDHomerun EXTEND devices. My home video and bluray rips from iTunes on my Mac. Other Internet based video from YouTube, iTunes Store among others. I am living the cord cutter life, definitely saving money because I spend a lot less than the $150 a month I was paying before. I do buy the show seasons I want from the iTunes store, but I would say I have saved 90% of the money I would have spent the last year. It just shows that the money was going to support channels and shows I just never would watch. I like that a lot, I feel like I get to vote with my wallet and it makes a difference. Just kicking the tires a little bit. A lot to do to spiff up the website for jflicks for cord cutters. A lot of news coming up in the next month I hope!